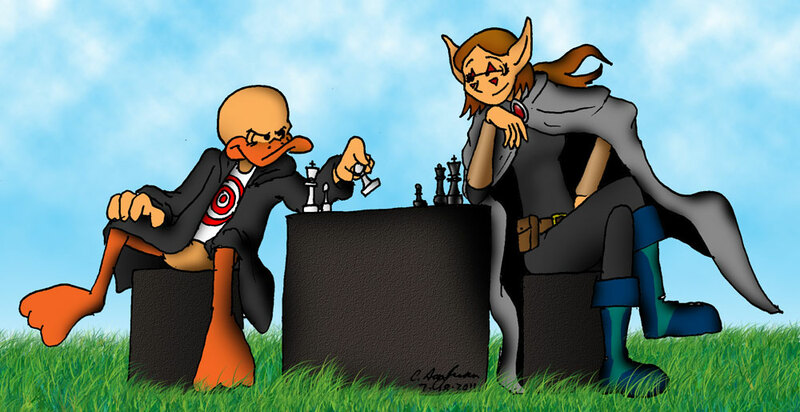 Carlo Jose San Juan, the creator of Callous Comics, has just sent me this wonderful piece of Epic fail Fan Art featuring Amuletts and Decoy Duck playing chess. He says ‘what many people don’t know is that when I imagine Decoy talking, he’s speaking in a British accent’ so it is poetic he should visit a British comic. I love getting Fan Art and this has cheered me up so very much! Carlo has drawn Amuletts perfectly and she would totally want to play with the Black pieces (black is one of her favorite colours). I’d imagine there’d be some money wagered on this game also. Callous Comics features Dr. Rianne Nicah, a struggling new physician, who braves the world with her Guardian Duck, Cal Duck, and his on-the-job mentors! It is a humour comic which has been going for an incredible 15 years! PHEW! It stars both human and anthropomorphic characters in both gag strips and longer story archs. Carlo and Callous Comics has been so kind recently sending Fan Art to lots of people so go and read his comic and give him lots of love.